If the events of last weekend are any predictor, Marquette will be in for another dramatic finish against Miami in the Sweet 16 on Thursday. Both teams played tight games that came down to the final few possessions, with mere inches separating agony from euphoria. As such, I decided to watch some recent tape of the Hurricanes to see what kind of offense they ran and, particularly, how they had fared in late game situations recently. It turns out that Miami hasn’t played very many close games during its current six-game win streak, winning all but one game by double-digits, but they have had some tight calls when looking back at the last month of the season. Since February 19, Miami has played 11 games, with five of those being one possession games with two minutes or less to go. The Canes are 3-2 in that stretch, beating Illinois and Boston College on neutral courts, Virginia at home and losing to Duke on the road and Georgia Tech at home. Now it’s no secret Shane Larkin is the engine behind Miami’s pick-and-roll heavy offense, as Mark eloquently illustrated yesterday, so it should come as no surprise that he is once again the catalyst in late game situations. Discounting possessions where the Canes were intentionally fouled while up six or more, Miami had 19 possessions in the closing minutes of those five games. Larkin was the main ball handler (either bringing it up the court or receiving the sideline inbounds pass) 13 of those 19 possessions, a full 68 percent of the time. Durand Scott handled it three times while Rion Brown had it twice and Kenny Kadji once. That stat alone highlights how imperative he is to that team, being trusted to create most of the offense in clutch situations. Yet, it’s not enough to know that Larkin did handle it, what matters is what he made of the possessions. In total, Larkin only had four empty trips in those 13 attempts at the basket. They included one turnover, two missed shots by him and a missed shot by Kadji off a Larkin assist. I’ve thrown a lot of numbers at you thus far so I know you are asking what it all means. Basically, as Buzz Williams would say, he’s really, really good. When Larkin has the ball in his hands in a one possession game down the stretch, he’s either scoring or setting up a teammate 69 percent of the time. As an added bonus, only once did he turn the ball over. That’s efficiency at it’s finest. 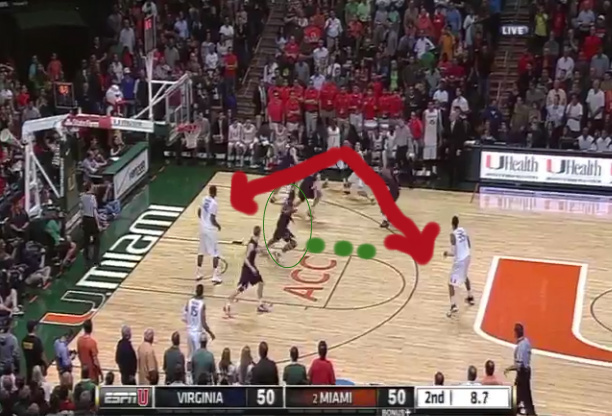 Now, not all of these possessions ended with dagger step-back 3s, as he cooly did against Illinois on Sunday. 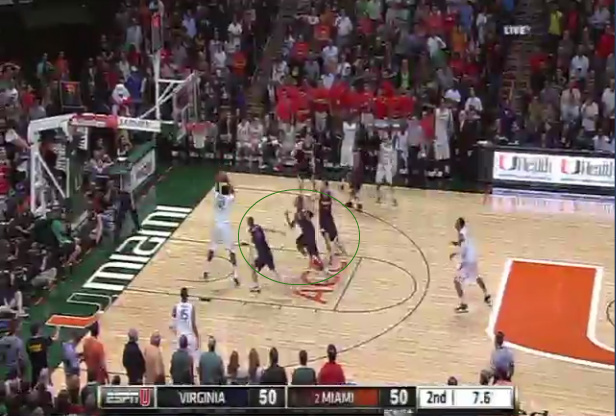 He gets fouled intentionally more than any other Cane, taking four such trips to the free throw line. While these don’t require the same offensive acumen that he has shown in live ball situations, they do reveal that he is not afraid of the big moments, going to and calling for the ball. All in all, Larkin is as dangerous a creator, particularly late in the game, as any point guard in college basketball and should be the focus of the defense, a la Rotnei Clarke on Saturday. He’s not as lethal a shooter as Clarke was/is, but he is a much better penetrator and distributes at a completely different level, but more on that in a bit. Zooming out a little bit, as a team, Miami scored at least one point 11 of those 19 late-game possession, drawing four intentional fouls and hitting seven shots. It’s easy to discount those intentional foul possessions as gimmees, but ask Davidson or even Marquette about them and they will tell you otherwise. Outside of Larkin, only Scott and Reggie Johnson have scored a basket, with Scott going 1-2 with one turnover and Johnson making the only shot he took back in February. Kadji has taken three shots, but is still looking for a bucket, missing an easy basket against Illinois that was fortunately rebounded and put back by Scott. All of this boils down to: get the ball out of Larkin’s hands. We’re not about simple here at Paint Touches, though. We like to kick things up a notch or two on the spice chart. It’s easy to tell you Larkin is phenomenal late in games, it’s a bit trickier to explain why, so I enlisted the help of some handy dandy screen shots to assist us. 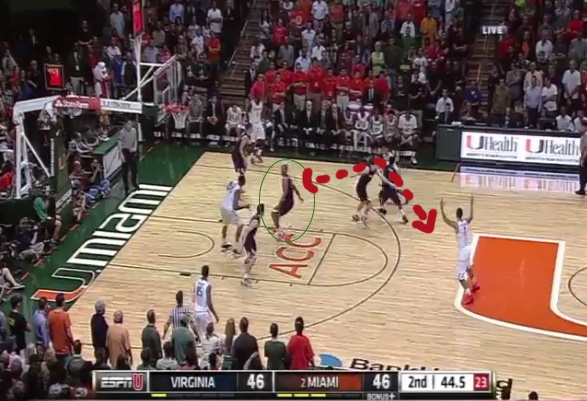 The first set of images comes from Miami’s tilt with Virginia back in February. There’s just under 50 seconds left in the game and the score is knotted at 46. Larkin will start the offense on the left side near mid court. 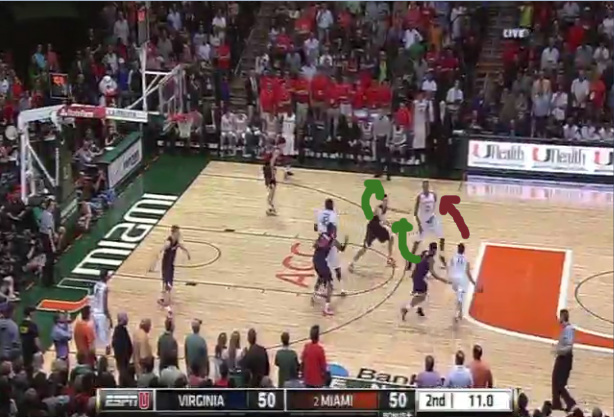 Miami then sets a double screen for him, beyond the arc, spacing the floor a bit by plopping two shooters in the corner. Larkin will use both screens to get to the other side of the floor. 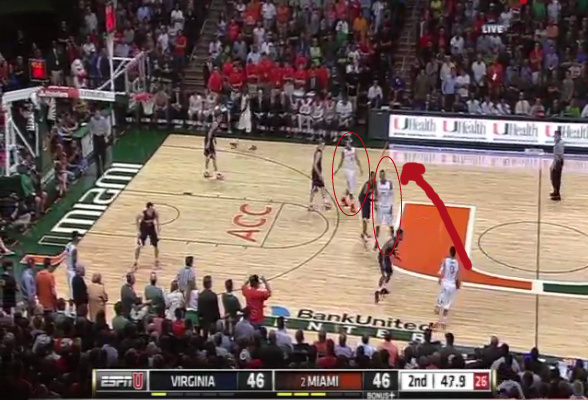 As the red oval notes, the second screener does a good job of re-routing the Virginia defender to give Larkin space. Meanwhile, Kadji, the first screener, rolls to the basket, drawing his defender to him with his back to the ball. Larkin now has two good options: he could swing it to the top of the key for a Trey McKinney Jones trey, or drive it to the hole himself. Larkin’s defender is still recovering from that screen and cannot contain penetration, while Kadji’s defender in the paint still has his back to the ball with no idea what is going on behind him. Larkin chose to keep it himself this time and, with his incredible speed, was rewarded with an easy lay-up. The next set of images are a continuation of this game, with less time left but the score still tied. This time, only Kadji comes out to set a screen up top. Keep in mind that Larkin has already burned the Cavaliers for a bunny a few plays ago so this time, Virginia is determined to stop penetration, with both defenders biting hard on his dribble. Kadji’s defender sticks with Larkin through the screen this time instead of rolling back to cover the shooter, which clogs the driving lane, but leaves Kadji completely uncovered. 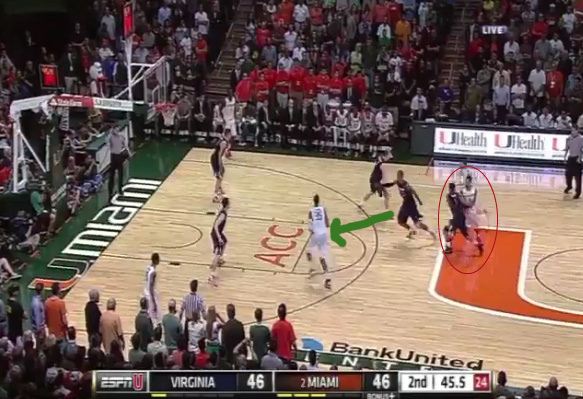 Seeing this, the Virginia defender in the paint rushes out to cover the open Kadji, but leaves Reggie Johnson wide open a foot away from the basket. Larkin immediately sees the opening, tossing an easy pass into a wide-open Johnson, who finishes the easy score. Just take a look at the three Cavaliers realizing what they had done. Too late now. What can we take away from that? For starters you can’t let Larkin go to his right. He is good driving with either hand, but it’s much easier to toss in a pass from the right side than having to go across your body. Next is that whoever is guarding Kadji has to hold Larkin long enough to let his defender get back in the play, of Larkin will drive straight to the hole. While Kadji does shoot the 3-pointer at a decent clip, 35.4 percent, he has yet to make a basket in a clutch situation and is not guaranteed to even get the ball back. Finally, the defender on the left side shooter has to be willing to leave his man unmarked to try and prevent a pass into the paint. I have yet to see Larkin make that cross court pass in late game situations as that is a high risk pass with many hands in the way. Now we’ll have to wait and see which wrinkles Buzz throws in defensively, but when the score is tied and your heart racing past your palms, you can take solace in having an idea of what is about to come.